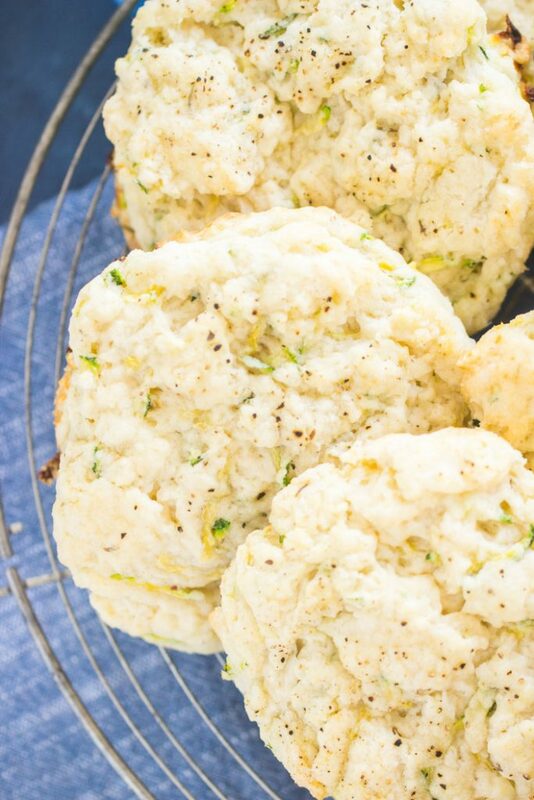 Flaky, tender, buttery, and soft, these Goat Cheese Zucchini Scones are everything you want in a biscuit or savory breakfast scone. With crispy edges, but insanely tender interiors, you will not be able to stop at one. 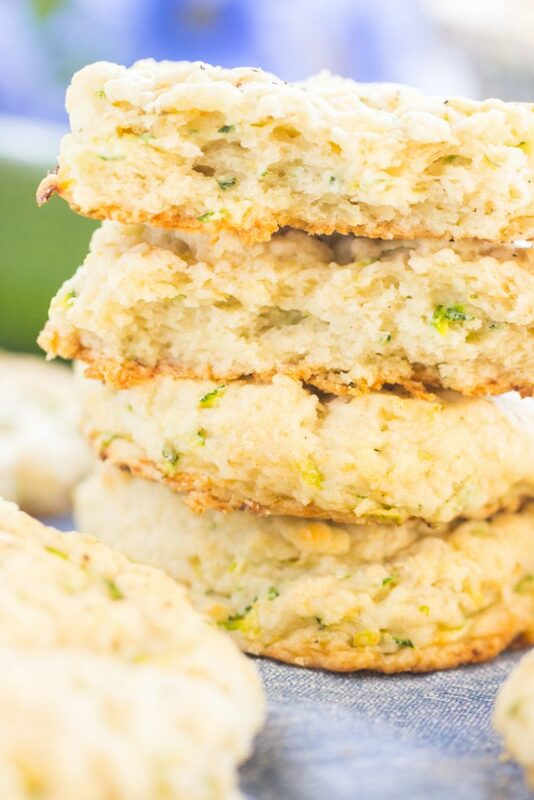 These Goat Cheese Zucchini Scones are awesome for brunch, or alongside dinner as a biscuit. 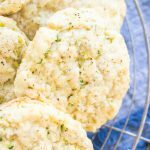 Are you tired of seeing me put goat cheese into biscuits and breads? Too bad. I loooove doing it, and the results are too good not to keep charging on. 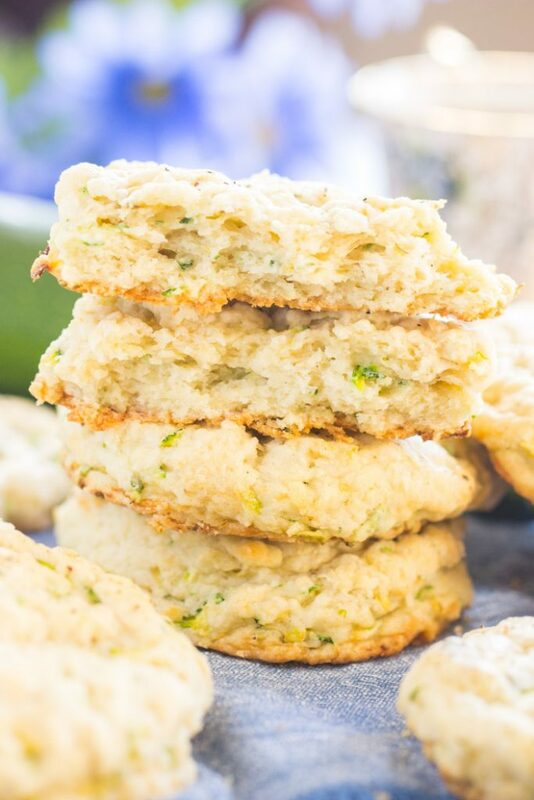 I did it with these Toasted Pecan Goat Cheese Biscuits, and this Goat Cheese Pumpkin Cornbread, and I’m not sorry that I’m doing it again in these Goat Cheese Zucchini Scones. 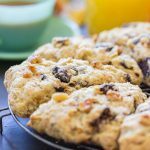 I will never abandon my original scones recipe that I’ve used to make COUNTLESS variations (see: Cherry Almond Scones, Brown Sugar Maple Bacon Scones, Chocolate Cherry Mocha Scones, Cranberry Orange Scones, and Pumpkin Pecan Scones to name just a few!! 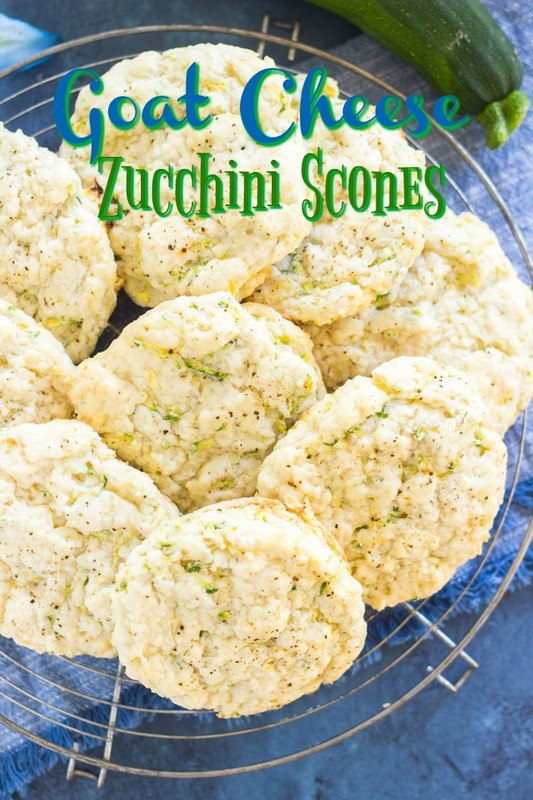 ), but I will say that this recipe I found for zucchini scones is an incredible scones recipe too, and I really like it for savory varieties in particular. 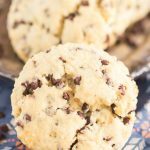 My favorite scones recipe uses only butter for the fat component and my favorite biscuits recipe uses only heavy cream. 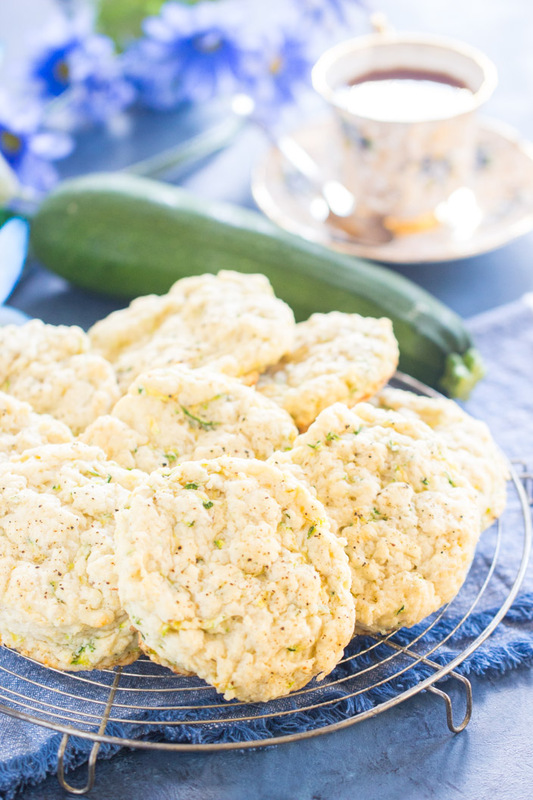 But these Goat Cheese Zucchini Scones use both! You get the best of both worlds that butter and heavy cream offer. These are NOT health food, that’s for sure, but they are unbelievable, and so so so so so worth it. 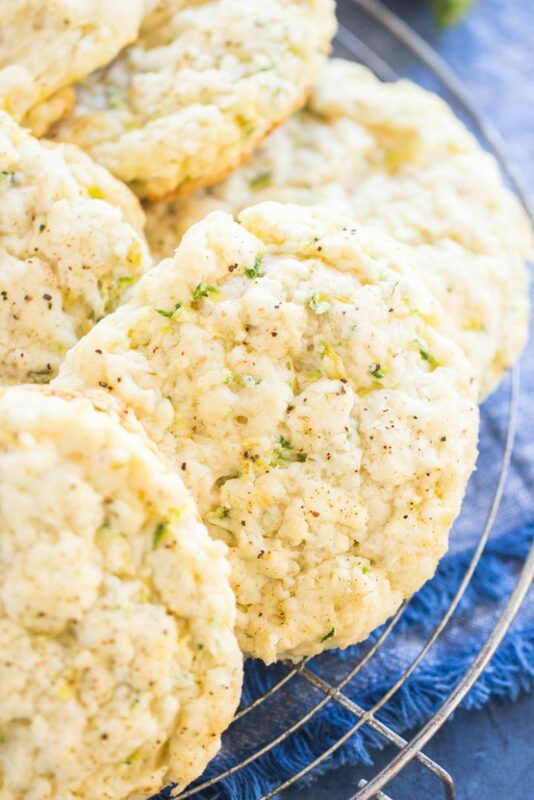 In addition to those key ingredients, the moisture from the grated zucchini takes these to another level. And yet another level of awesomeness from melty morsels of creamy goat cheese dispersed throughout these scones. Some of them stay intact, so you get a nugget of goat cheese, while others mix into the dough, and it makes the dough itself almost creamy too. Thyme… oh my. What an under-appreciated herb in my household. I pretty much always want to use dill in savory things, but thyme has such an important time and place, and it gets its moment in the spotlight here. It’s perfection in these scones. I feel like these Goat Cheese Zucchini Scones don’t look like much though, and I’m sorry for that. It’s hard to make biscuits look enticing in photos. As you know, scones are one of my favorite things to make because there’s something incredibly gratifying about being able to start and finish and eat a baked good in about 40 minutes. There’s not a lot of things that you can start from scratch, and be eating only a half hour + later. They’re very satisfying to make. We made breakfast sandwiches from leftover Goat Cheese Zucchini Scones, toasting them in the toaster oven, and filling them with scrambled eggs and bacon. OMG. Do that this weekend! You won’t regret it. In a large bowl, whisk together flour, sugar, baking powder, salt, black pepper, and thyme. Using a cheese grater, grate the butter into the dry ingredients, and whisk or stir to distribute the butter shavings. 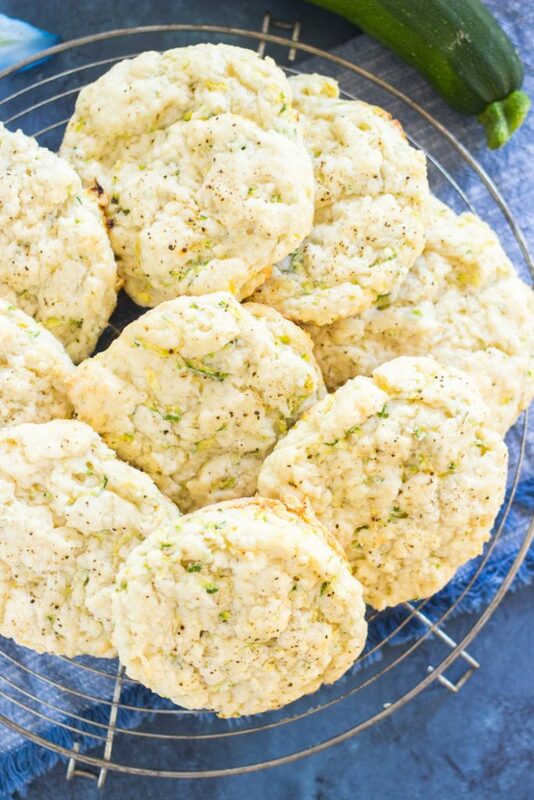 Whisk in the zucchini and goat cheese to evenly distribute into the dry ingredients. Drizzle the heavy cream into the dry ingredients, stirring to distribute - cream will absorb very quickly! Dough will quickly begin to clump together as you stir in the cream. On a lightly floured surface, turn out the dough, and knead gently 7-8 times, or until it comes together. Do not overwork the dough - just knead til it comes together, adding additional cream as needed for it to be just moistened. Dough will be kinda sticky, just make sure to flour your surface. Pat into a 1-inch thick disk. Using a biscuit cutter or 3-inch round cookie cutter, cut out as many rounds as possible. Reform dough scraps, and cut additional rounds. 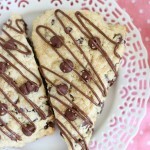 Arrange scones two inches apart on parchment paper or silicone mat-lined baking sheets. Brush tops with heavy cream, and sprinkle with additional pepper, if desired. Bake at 350 degrees for about 30 minutes, or until bottoms and edges are lightly browned, and the centers appear set.